Feb. 12, 2013 - PRLog -- Efficiency Vermont, a statewide energy efficiency utility, presented an Honor Award for Comprehensive Efficiency to the Norwich Passive House by ZeroEnergy Design (ZED), a Boston based green architecture and mechanical design firm. The award contest sponsored by the utility strives to recognize innovative and integrated design approaches for energy efficiency in Vermont’s residential, commercial, institutional, industrial, and multifamily buildings. 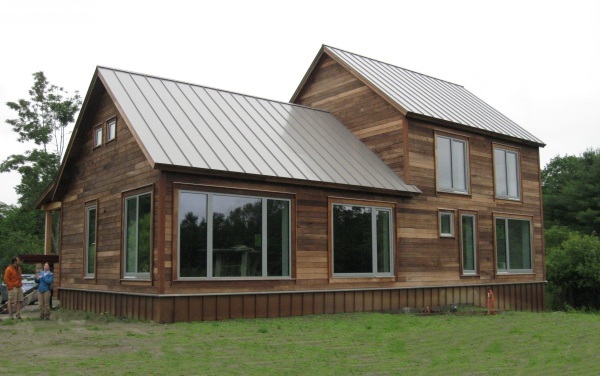 Efficiency Vermont designated the Norwich Passive House as the “Best of the Best in Energy-Efficient Residential New Construction”. The Norwich Passive House meets the requirements of the most rigorous energy performance standard in the world, proven by recent confirmation as a PHIUS+ Certified Passive House. ZED’s Stephanie Horowitz AIA CPHC provided schematic design as the architect for the home, while ZED’s Jordan Goldman CPHC provided passive house consulting and mechanical design for the HVAC systems. Other team members included Estes and Gallup, Bensonwood, Paul Bilgen, and Architectural Openings. “The Norwich Passive House is an excellent example of the exceptional energy performance that can be achieved before adding renewable energy. The hidden result of such improvements is really extraordinary comfort for the occupants – all year round”, said Jordan Goldman. Located in Norwich Vermont, the air-tight, super insulated house features R-60 above-grade walls, R-87 roof, R-36 basement walls, an R-75 basement slab, and air leakage of only 0.49ACH50PA. Energy monitoring systems help to track consumption, clarifying use at a fraction of a typical home built only to code requirements. ZeroEnergy Design is a green architecture, mechanical design and energy consulting firm specializing in new construction and major renovations for homes and buildings. The distinct union of great design and energy performance, enabled by a multidisciplinary team, makes ZED uniquely equipped to originate designs tailored to a client’s requirements, environmental ideology, and unique sense of style.